Admittedly, for someone that briefly worked as a florist, I’m not much of a real roses fan. Don’t misunderstand, I regard them as simply beautiful, and when in quantity add up to a good day’s total at the cash register. As a customer, though, they just wilt too quickly for their cost. Even the outdoor bush and plant variety always seem to soon enough become sick or mutated and die in our yard, sadly. Now I have the kind of roses whose beauty will last and make for a great deal! Heck with the old song, “Red Roses for a Blue Lady”. These are roses for a lady who likes vintage styles! Here is yet another garment where I’ve repeated what I know I love in a project – channeling a feminine ‘Betty’ outfit from the television show Mad Men again (second season this time; other Betty dresses here and here) and also using a true vintage fabric (my most recent one here). As good fashion never really goes out of style, I do think this dress has the same qualities as the costumes of Mad Men, period-appropriate but also timeless and fashionable even to modern viewers. 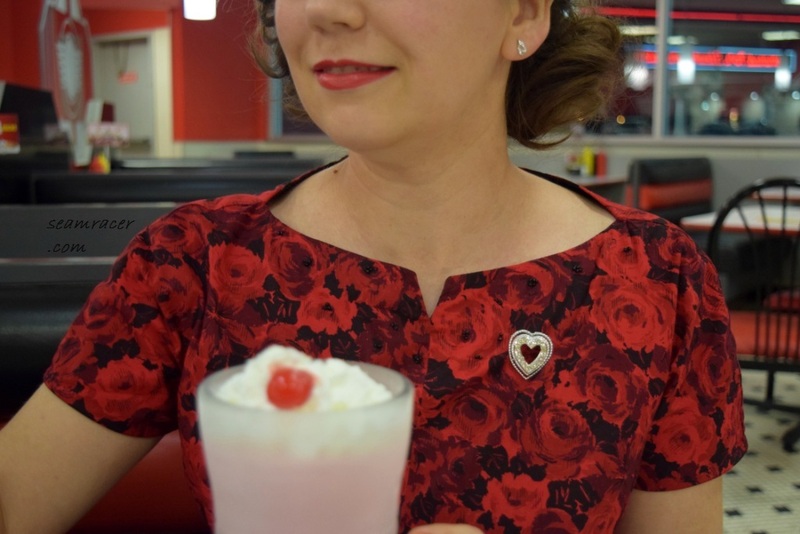 I paid attention to details like I had all the time in the world, and did tons of hand stitching, even adding seed beads, for a dress which is my own perfect Valentine’s Day treat! My fabric choice is a pristine condition, polished, printed cotton from the 1950s (surmised from many recurrent similar extant garments of that era). I found it as a lonely piece at a steal of a price thrown in the corner of an antique mall shop. How could I just leave it with its saturated red goodness at that cost?! 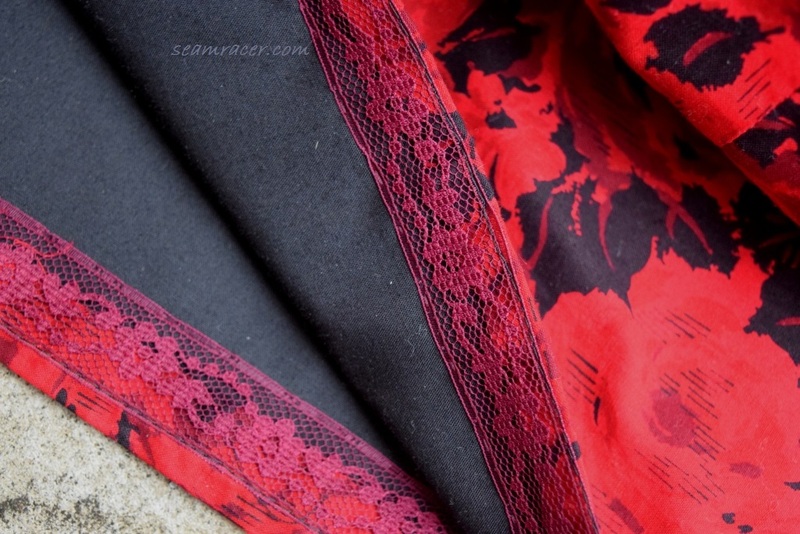 So – a good fabric deserved a really great pattern…one that has intimidated me every bit as much as I adore it. I came upon a find, I saw a perfect project in mind, and I have conquered it! However, the finished wiggle shaping ends up making my body look like a very shoulder-and-hip-heavy hourglass ‘Joan’ silhouette that I really am not used to but am completely taken by nonetheless! NOTIONS: The basics I needed were on hand – thread, interfacing scraps, a hook and eye – but the zipper (22”) and the beads I bought recently just for this as I realized exactly how I was going to detail it! TOTAL COST: This vintage fabric was only 8 freaking dollars, people!!! The cotton lining I received for free, and the beads were only $2. So this is an under $10 dress! Such a deal. Why, oh why is it that the best fabrics I find seem to frequently come in small cuts? It’s like some sewing Karma wants to test me at every turn and always make sure my projects are a challenge. This rose fabric was in a ridiculously small 35 inch width (one of the reasons I can estimate the vintage) and was a hairs breath under 2 yards long. Under the envelope back listing for 35” width fabric, it says I needed 3 yards for this dress. Yikes! The only way I could make things work was to piece together a full one side back bodice panel and to add a horizontal waist seam to what had been intended as a smooth center front. The print is complex I do not think the extra seams are noticeable but I know they are there, nonetheless (well, so do you now). The center dress panel change especially makes me a bit sad (seen or not) because I loved the streamlined look of it with one-piece, streamlined, princess-style drafting as on the original design. Not too shabby of a compromise, though, and at least the lining was cut properly without extra seams! Granted, every piece was butted up against one another when laid out, so it’s a lucky thing I did not have to grade up in size at all. The skirt had to be shortened by about 5 inches and the kick pleat eliminated to make things work, so I was literally left with nothing but tiny triangles of scraps leftover. Although stressful, even mind stretching, it feels so good to be super-efficient and determined with a project idea! If there’s a will, there’s a way, as the saying goes. I am glad I had put off tackling this sewing project until now when my sewing skills are where they are at. The overall dress was not hard to make. It was the detail points that were the challenge, which was a difficult one that I have not had in a while. Luckily, I had some practice ahead of time to help me out on the trickier spots of this dress. A few of the projects I have made already have had some of same the details I encountered in making my red roses dress when all of them were in one project. The underarm bodice panel/kimono sleeve combined into one element reminds me very much of my 1955 Redingote, as does the belt attached in at a front waist dart. The side paneled bodice shaping is just like on my recent 70’s style Burda jumper. The pleats which cover up a seam, like the ones at my waist, are call to mind the pockets on my “Spring Green” Easter suit of 1954. It is good to challenge oneself, but at the same time I want to stress it is beneficial to work up to that scary hard pattern by finding projects ahead of time which prepare your skills for a successful turnout. A fruitful finished sewing creation makes all the difference in confidence and estimation of worth in time and effort. The bodice panels turned out the best I’ve ever done yet, happily, thanks to knowing what to expect. I do love the way such a design element in the garment provides the best ever shaping for ones bodily curves, besides being the most comfortable form of a kimono sleeve…better than one with underarm gussets. Look for something similar to try for yourself – you will love the way it wears! Only, I thought the bust for this pattern ran large until I put on the period-appropriate longline bustier. Then, suddenly I had that curvaceous 50s figure and a perfect fit that put me in awe. So, a word of warning – in a 50’s pattern, beware that their curving accounts for more than what modern women are used to with the lingerie of today. Unless you are willing to try a different style of underwear, or unless you find such a design element in a pattern from another decade closer to now, the wonderful shaping which you will find with a bodice panel/kimono sleeve combo might be more than you expect. Those front waistline pleats where the belt is attached were the toughest part to tackle. It took me about 4 attempts to figure them out correctly…but just look at them! They remind me of the interesting pleats which can be found on some 50’s or maybe 60s couture garments. Two of the pleats that provide the slight hip poufiness are angled out and folded down. The pleat that encloses the belt and bodice side panel seam is perfectly vertical and folded towards the other two pleats away from the center front…so confusing on paper but awesome finished properly. The fabric makes it really hard to photograph these details as clearly as I see them. I’m not complaining about this wonderful fabric one bit, though! Modern cottons are sadly missing out on the lovely sheen which vintage polished cotton has, not to mention the saturated dying process that makes it almost reversible. Yet, vintage polished cotton is a bit sheer and stiff on its own, thus another solid opaque layer was needed under my dress for a non-transparent and natural-bodied hand to the fabric. Besides, I am silly and would rather make a whole second dress as a lining so as to have an impeccable, second skin finish inside…not just to cover all the seams but mostly to eliminate the fussy neck facings. Having more than enough cotton lining gave me an opportunity to cut the dress out the way it should have been with no adaptations. Except for the major seams inside, all else to this dress was hand stitched invisibly. This has been the first garment where I really sense that my hand sewing skills have grown to be similar to my machine skills – accurate, fast, and efficient. The lining is hand tacked to the zipper (which was also hand installed to the point it is as good as invisible); the neckline, sleeve hems (after a machine added ¼ inch bias binding), and skirt hems (after lace tape added to the under edge) hand finished. Not that it matters – who else but me really sees inside or even gets close enough to notice the details? Whatever. It’s that choked-up, happy emotion I get inside seeing the unnecessary extra particulars so fine as I’m dressing. It makes you feel special, and reminds me that the beauty inside a person, like a garment’s inside, although unseen, is the best part. It’s these same sentiments and the urge to try something new that prompted me to add a bit of beading to the neckline. Not that the neckline is not a statement in itself! This is one of the best fitting boatnecks I have come across, and the little notched front heightens the neck and shoulder emphasis by centering under the pit between the collarbones. I merely added some clusters of 4 to 6 seed beads at a rose center which might be near the neckline center top edge, with a few smaller 2 or 3 bead accents on some petal tips as shading. I was tempted to go and add the whole package of beads so it would show up better, but there is something I love about the understated elegance to not going overboard. I do not want gaudy or distracting details to subtract from the dress and its fabric, and the more I bead, the more there is pressure to turn it into some sort of defined design…then my beading skills have to be better. I did attempt to make a simple 3-D flower out of strings of beads to add on the end of the back waistband. It’s not perfect, but pretty nonetheless, and just the perfect touch if I do say so myself. Vintage is admired and long lasting because of its understated quality and beautiful ingenuity…these are the details I miss the most in modern ready-to-wear. So, if I can bring a small part of that back in my own life and be the example, then I am happy. If I can remind others they are worth feeling good in their skin by a wonderful dress, and that creating is good for the soul, than my garments are beneficial to more than me alone. 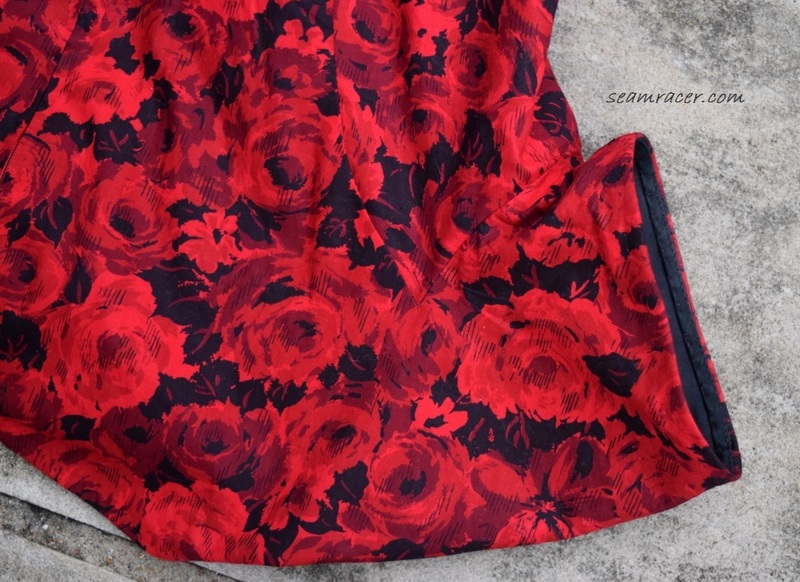 Hopefully with the time, attention, and care I put in towards my dress project, this red roses vintage fabric will have a lovely new life for many more years to come! 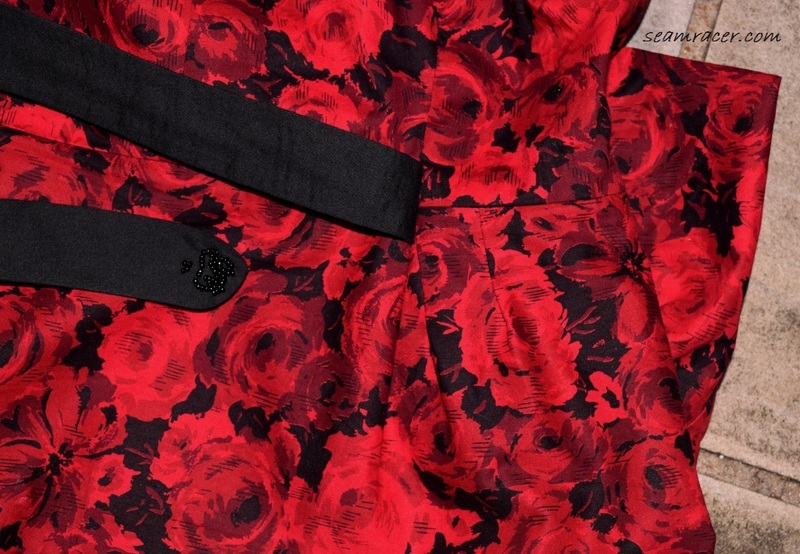 I know this dress will be seeing more than just a Valentine’s Day wear! As pretty as this dress might seem at sight, this beast was a nightmare to make. Luckily there is at least a happy conclusion! 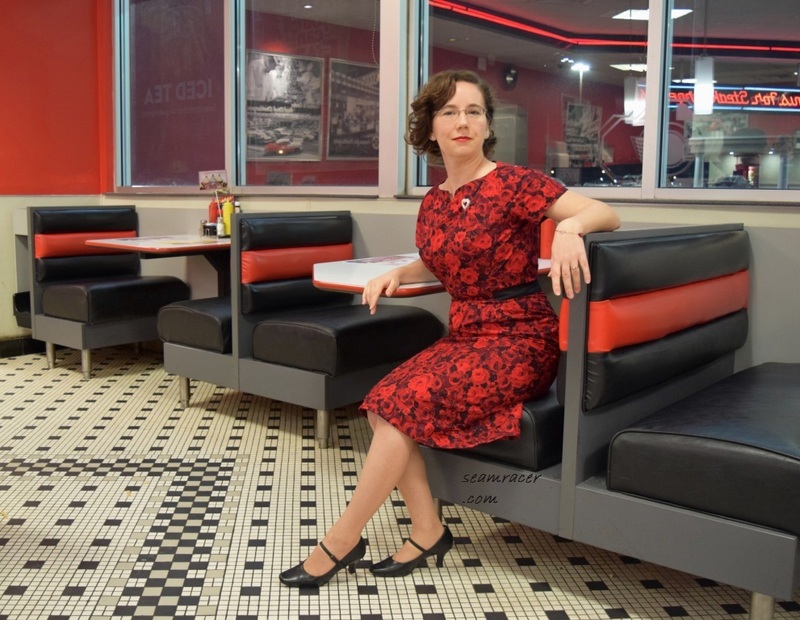 I do love wearing this – it totally feels like the best of a classic dress (in a vintage design no less) which is comfortable, feminine, handy (with the pockets), and oh-so flattering! This is a faux asymmetric wrap dress reissue, first released by Burda Style in January 1958, very applicable and wearable for today. I did have a different plan for how I intended this dress to turn out for this project but I felt it was best to listen to the fabric and leave what’s well enough alone! I’ll admit that a good part of the problems I encountered here were because of my choice of fabric. I hate the fickleness and frustrating delicacy of an all-cotton knit! But that can’t take all the blame. You see, I find Burda Style’s vintage designs to be quite problematic and almost always an exhausting near disaster that requires much fine tuning and the outlook of possible tragedy acceptance to turn into a success. It’s not so much the fault of the garment design lines…I find the problem is mostly with the patterns’ ill assembly and poor sizing. This is why I stupidly keep using Burda’s vintage designs – because in the end they do turn out a wonderful vintage garment with a modern, timeless feel! 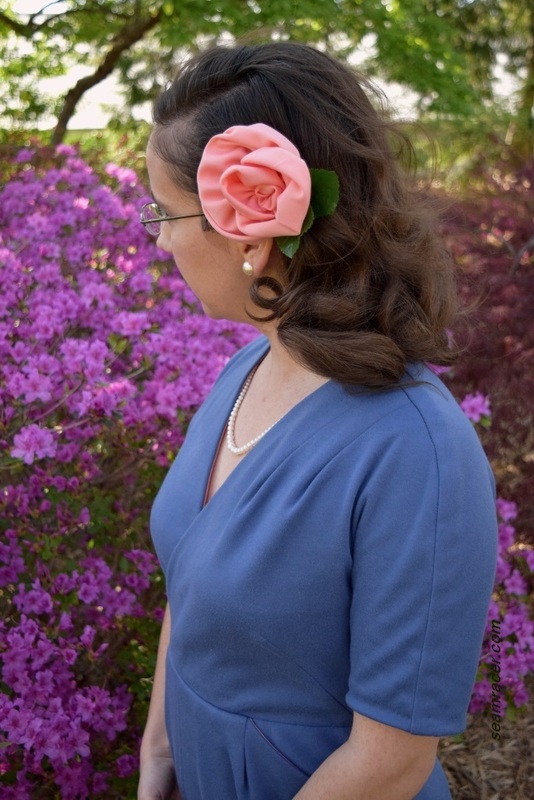 A 1950s Dior-style flower, made by me as well from fabric leftovers of the lining, was sewn onto a clip and became both my matching accessory and color contrast. My prized vintage style leather Miz Mooz heels tie in the retro feel and provide a neutral tan. However, the blooming rhododendron bushes (behind me) at our towns botanical gardens sure made me realize that blue is more of a neutral color than I thought. It pairs well with all the colors of spring! THE INSIDES: All raw edges are completely covered by the second skin interlock lining inside! TOTAL COST: Taking into account that the fabrics for my dress have been in my stockpile for maybe up to 15 years now, I’m counting this project as a free, no-cost, stash-busting success! Now, as for any Burda Style pattern, printing and/or tracing is necessary to have a usable pattern to lay on your desired fabric. My pattern was came from the monthly magazine issue, using a roll of sheer medical paper to trace the pieces out from the insert sheet, but if you buy from the online store, you download, print, and assemble the PDF file you receive first. It’s at this preliminary step that I pick out my chosen size and add in your choice of seam allowance width (I normally add in 5/8 inch allowance), but others do this directly on the fabric as they are cutting out. A scissor with a magnetic ruler guide attached helps immensely for adding on the seam allowance easily. Sorry to repeat something you might already know, but this is just an “FYI” for those that don’t. Now, prepare yourself for unbridled criticism in the form of a sewist’s horror story. When I was making this dress, there were so many inconsistencies with the balance marks not fitting quite right and little areas everywhere that needed stretching in the ease just to have everything match up. I do not necessarily think this was due to faults from my tracing out of the pattern either – I am usually so very precise about being ‘perfect’ at the preliminary stages to a project. These pattern irregularities make me definitively say that this needs to be made with a knit. I’m not talking about one with a high spandex content or one that is super drapey. The model garment is I believe made using a wool jersey. I can see a quality scuba knit even working out well here. Either way, I would recommend choosing something with a nice body and a stable give to its stretch for this dress to be a success. 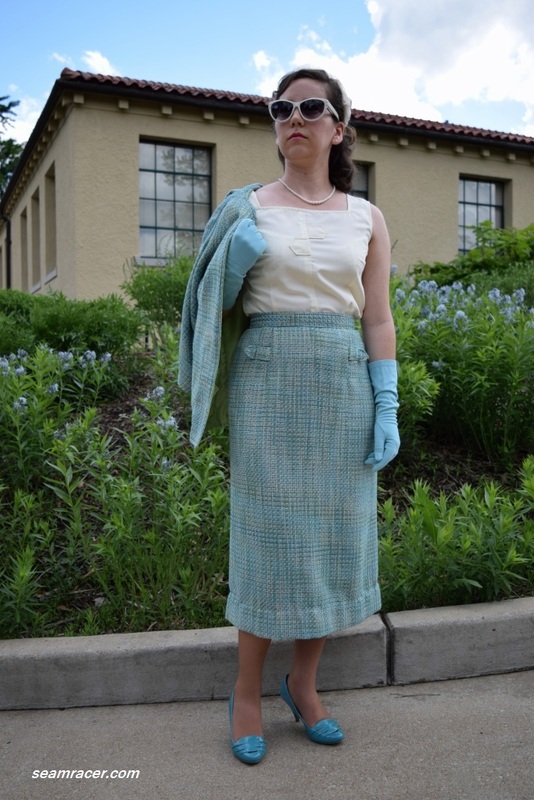 A knit will be more forgiving to the inadequacies of the pattern’s assembly, yet it also needs to be a material that will help this lovely dress keep it wonderful 50’s design. However, the most glaring and sad shortcoming of the pattern was the way the waist length of the un-pleated asymmetric bodice front was several inches too short to connect to the skirt or even match with the bodice back. I am mystified at what happened here and want to blame the pattern but at the same time I cannot positively rule out that it was an error on my part. Either way, I was stuck to adding on a panel swatch to lengthen the waist. There was no more fabric leftover for another bodice piece to be cut, so an awkward add-on was my only bet to save this dress project. I do not think it is really that noticeable, although I have called it to your attention now! It kind of looks like a mock belt to me, anyway, and half of that bodice is tucked under the overlapping one after all. All I can say is watch out for that spot on this pattern if you try it for yourself. The mock wrap to the bodice is further unconventional in the way that the left is over the right for my dress. This is the tricky part about asymmetric fashions there is a very precise right side up to the pattern pieces. In order for them to specifically be for the left or for the right side they have to be cut with a foresight that justifies the puzzle that asymmetric fashions are. I traced out the patterns as they were on the insert sheet and assumed they were giving them to me with all the right sides up…not so! 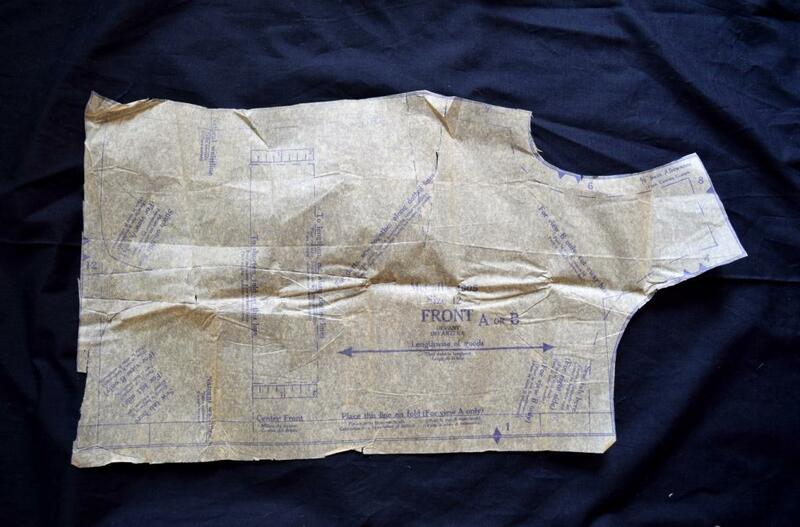 The bodice fronts actually are traced out wrong side up. Do not put too much faith in a pattern but always think things through for yourself. That said, I myself am not perfect, and have been struggling with some ill heath lately, so I was not at the top of my game going into this. Only when I was too far along assembling this dress did I realize how my asymmetric front was oppositely convoluted. At that point, I felt it was more important to have the pleated half as the top layer of the mock wrap bodice. I reconciled myself with the fact that this would be a uniquely individual garment, and as long as it turned out I would be happy with the right and left side traditional closing being off. As if these last problems weren’t enough, I had a mishap with the fabric and was forced to turn my dress into short elbow length sleeves. I originally intended on the full quarter length as shown, but there was an inkling in the back of my mind that I might not like them. As traced from the pattern, the sleeves were actually quite longer than quarter length – more of a bracelet length, reaching just a few inches above my wrist. I felt that such sleeves might overwhelm the dress and make it seem more like a winter garment (it was released in January 1958). However I wanted a transitional cool weather spring dress. Well, the dress made up my mind for me. You see, I do not get along with all cotton content knit. Sure I have several success stories with it in the past (here and here for only two examples). Yet every single time I use it, I hate it. I think this blue knit is about the last of its kind in my stash (there’s one more), and when it’s finally gone I should celebrate. I use the right needles that I should be using (ball tip, for jersey knits), and in the past I have tried every other kind of needle just as a test, and I still get the same sad results. This fabric for me is a no-mistakes allowed fabric because wherever there is a stitch made, there will be a hole leftover if that stitching is taken out. It says together decently enough when stitched as long as those stitches are left alone, but even too much stress on a seam and things will get ugly because cotton knit gets runs in it just like pantyhose! Has anyone else run into these problems with all cotton knit? Surely I am not unique with this. Anyway, I had particularly bad hole, leftover from an unpicking attempt, start unravelling the fabric in one of the sleeves a few inches down from where the underarm gussets end. Well, I had to laugh. I had been struggling with this dress enough, and still had the entire lining to sew at this point. I wasn’t sold on the full length sleeves in the first place. The best fix was to go with my gut and make them short sleeves, like I thought! I love the length of this sleeve and must say I think it does wonders for the overall shape of the dress. The sloping shoulders and the gussets are a tad confining, anyway, so the short sleeves make this dress much easier to move your arms in, too! I did not really make any major or unnecessary changes to the design, except those done to save the dress from ruin. After all the troubles I had come across, I kept the skirt simple and opted for no back walking vent. Such a feature would not really work with a knit fabric anyway. Having a one piece skinny tapered skirt really amps up the curvy silhouette to this dress, after all! I am not one for popular, stereotypical pin-up styles, but the no-slit skirt is I feel as small nod to those fashions. I have no trouble walking in it without the leg vent, as the knit is a bit forgiving anyway. There is a very wide 4 ½ inch hem at the skirt bottom to make as long as you see it on my 5 foot 3 inch frame. The front skirt details were the most successful and relatively easy part of the whole dress. Granted the pockets did not fit together very well when I lined up the skirt over the side hip panel. Big surprise! But the mismatching pockets actually helped the hip section of the dress to pouf out properly, which in turn disguises how roomy those pockets actually are. 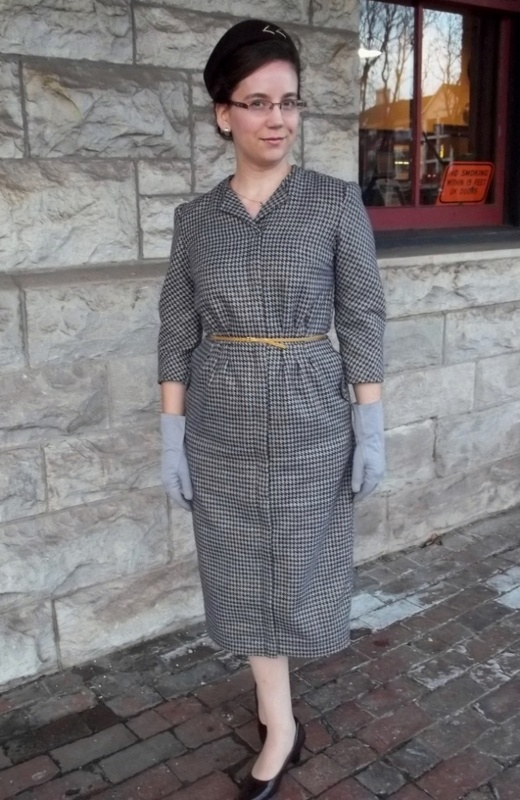 I have already made a dress from the previous decade (one of my Agent Carter 40’s fashions) which had a very similar side front hip pocket style so this must have been a popular feature in the middle 20th century. I not surprised. Since when can you have a dressy dress that actually has very useful pockets that are part of the smart design lines?! Just remember, with this kind of skirt you cannot have a tight fit because not only would that pull open the pockets, but it would ruin the important element of that design feature. The skirt front is meant to complement the waist by exaggerating the hips (as the 1950s were wont to do) in conjunction with softening the shoulder line by using kimono sleeves and underarm gussets. One last note that is neither bad nor good – the waist to this dress is quite high. I didn’t see it on the model until after I realized it on myself. 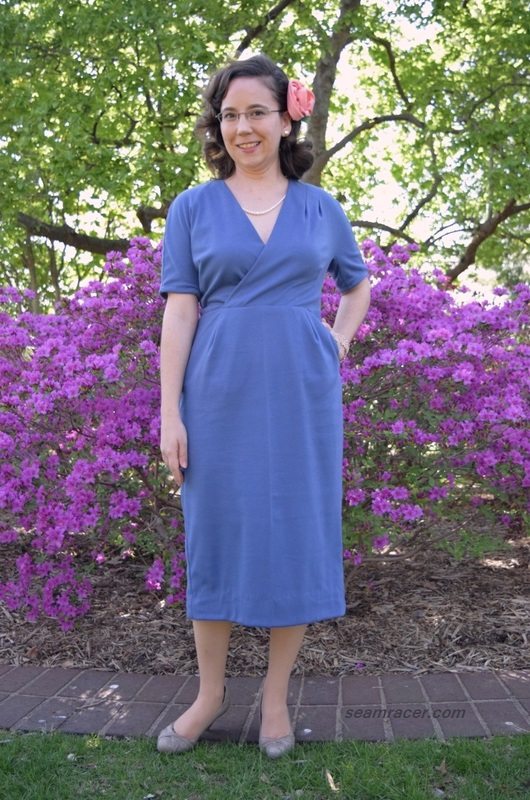 The high waist on my body is about 2 inches below from the dress’ waist seam, and it looks to be about the same for the model dress from Burda Style, too. This is kind of odd, and I don’t think that lowering the waistline no more than a few inches would hurt the overall design. In same breath, I also would like to say that much as I’m not crazy about the higher waist seam, I actually think it does this dress good. 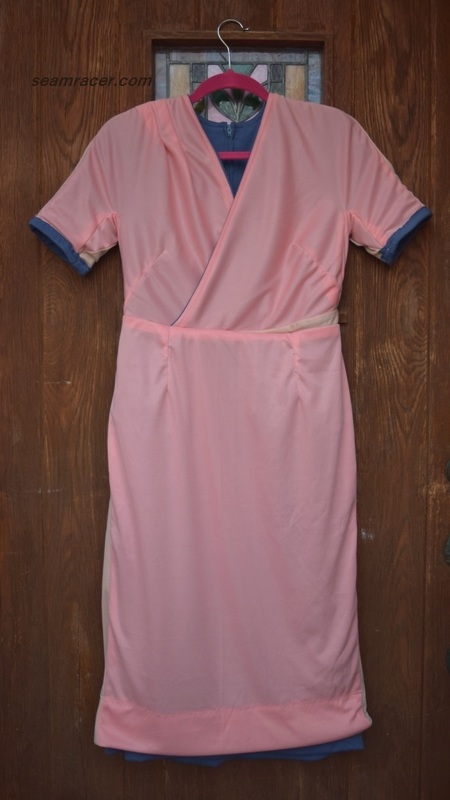 Many 1950s dresses or tops with kimono sleeves have them so deeply cut that they are supposed to taper right into the bodice at a high waist (such as on this dress of mine), thereby shortening and widening the top half of the female body (image wise, granted) and overemphasizing the hips by not just padding, pleats or what not, but also by starting at a high hipline. Even though the 1950s were heavy on the body mage crafting, especially when it came to employing torturous undergarments to achieve that idealized shaping, the general silhouette can still work well today on many body types. Accepting and embracing our womanly curves and shaping with fashions that delicately, thoughtfully compliment them (such as this dress) is empowerment at its best. It is the 1950s finding its modern freedom of re-interpretation. When I was planning out what fabrics to use for this dress I had these grand plans to add cut-out floral designs to the bodice and skirt hem of the dress. These designs would have been in the style of the amazing Alabama Chanin – see what I mean here. This is the primary reason why I used my lovely peach remnant of interlock as the lining. I expected the peach lining to show through when I would cut away the dusty blue top layer. I do enjoy how the little bit of peach peeks out from the seam edges along the pocket tops and bodice wrap neckline! It’s like a sneaky peek hint of the time I spent to make the inside just as pretty as the out, besides being a fun and unexpected color combo. After the dress was done, I sort of like the chic simplicity of the design as it is. Is has a refreshing appeal that can be made a bit more casual or dressed up with the right accessories, and a clear asymmetric design that would be detracted from with any other added business going on. Besides – the way the fabric frays and comes apart I was definitely not doing any unnecessary cutting! My dress was done, it was lovely, it fit me and I saved it from way too many near disasters. Most importantly my sewing sanity was still intact. I’m smart enough to know when to stop with the ideas…most of the time! I do hope I haven’t scared you off from trying this pattern for yourself. Rather, I would hope this post might be regarded as equipping you to succeed if you try the pattern. 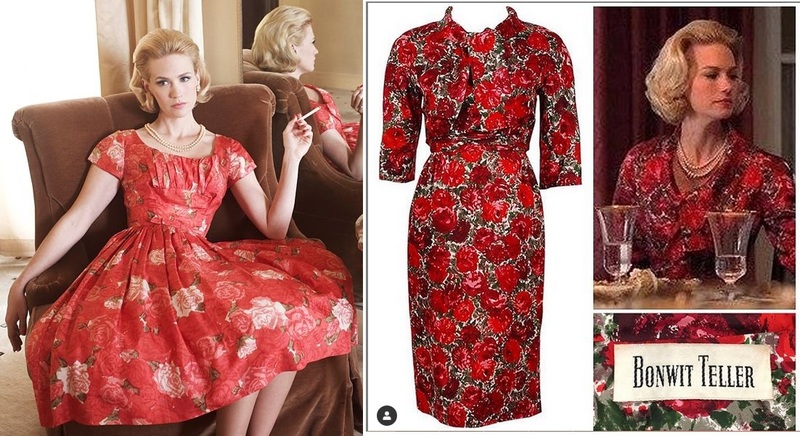 The 1950’s are indeed at decade of lovely fashions, and I think this dress is a really easy way to wear a truly vintage look without appearing to be in a retro style. It’s like vintage blending in with the modern world, and this is the styles I love to find. Our fashion of today is often lost and misdirected in the whirl of four seasons a year of new fads, new ideas, and attempts at creativity. Sometimes we just have to slow down, look around back to where we came from and let those smart fashions been seen right in front of us, where they have been all along…in the past classic styles which have never gone out of season, never needed updating. 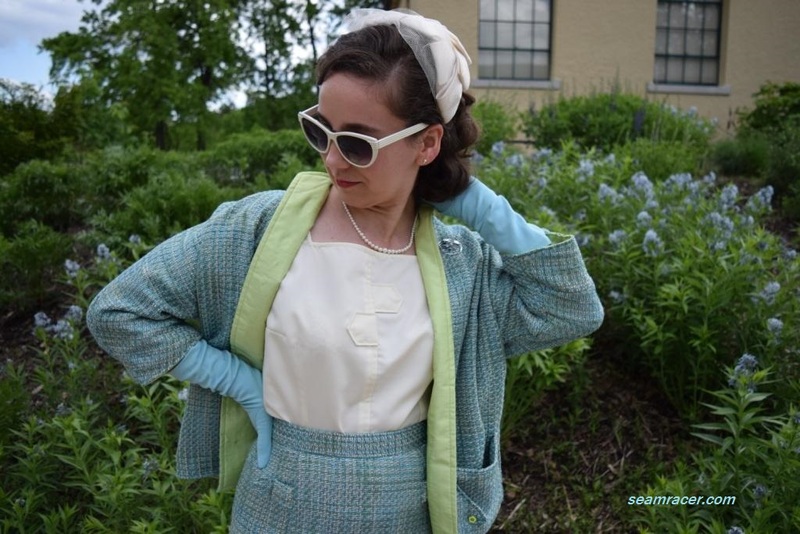 This year’s Easter outfit from earlier this year’s spring left me with a lovely year 1954 reversible jacket and an exact one yard of lovely boucle suiting leftover. Another dress I made this spring (yet to be posted) also left me with another one yard that seemed like it would match well with the suiting. Humm…seemed like potential just waiting for the making. I just couldn’t help myself but to continue the mix-and-match properties of the jacket and make a different look composed of separates from ’56 and ’58. I’m so pleased to get further use out of my fabric leftovers on hand and give my jacket something else to match with. The 50’s really can provide some effortlessly lovely pieces when you don’t have generous cuts of material! I feel so put together in this! My jacket is was made earlier for my Easter suit (as I mentioned already) from a year 1954 Simplicity #4793. 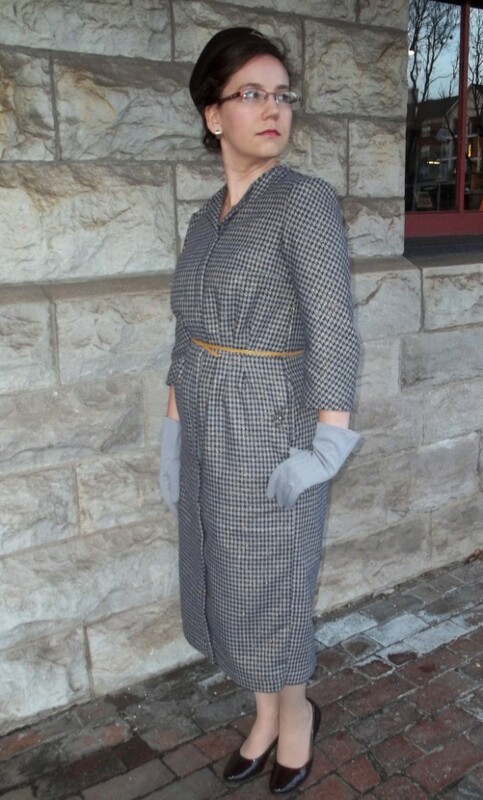 Thus, if you think about it, my outfit in this post skips every other year through the middle of the 50’s. I suppose this would be plausible for a lady of the 50’s to do something like this outfit, perhaps she might add to her wardrobe as the years went by with one more simple-to-make piece so as to keep up with the styles of the times. I think it works well together – especially when I add a vintage headband-like netted hat, elbow length gloves, cat-eyed sunglasses, and my wonderful “Hunter” turquoise B.A.I.T. brand heels! FABRIC: The boucle for the skirt (and jacket) is a rayon/acrylic blend; inside the skirt is a polyester cling-free lining leftover from on hand in my stash; the blouse is a cotton gabardine (leftover from another project yet to be posted). TIME TO COMPLETE: This was a fast outfit to make – the skirt took me 6 hours and was completed on March 22, 2016 while the top took me maybe 4 hours and was finished sometime in April 2016. THE INSIDES: So nice! The skirt is fully lined and hemmed with bias tape while the top is French seams with bias hems and edges. A classic pencil skirt is more or less about one yard of fabric very simply wrapped around and darted to make an awesome basic wardrobe staple every bit as suitable today. With such a basic design, it’s all the little details that make pencils skirts stand out to me in the 50’s. This skirt is no different even for being a “teenager” pattern. Look at all the cute options on my Simplicity 1732 – you can bet you bottom penny that I intend to try that suspendered jumper option, as well as the asymmetric front pleated style. My skirt version definitely has subtleties – two cute little pointed tabs out of the front waist darts and a triangular closure tab at the center back waist. Aren’t they cute?! At least I think so. Sure they might emphasize the hips but this is the 50’s after all and the top I chose is meant to balance things out. My skirt’s tabs co-ordinate perfectly with the tabs on the top. The tabs are small enough not to make my set too matchy-matchy. 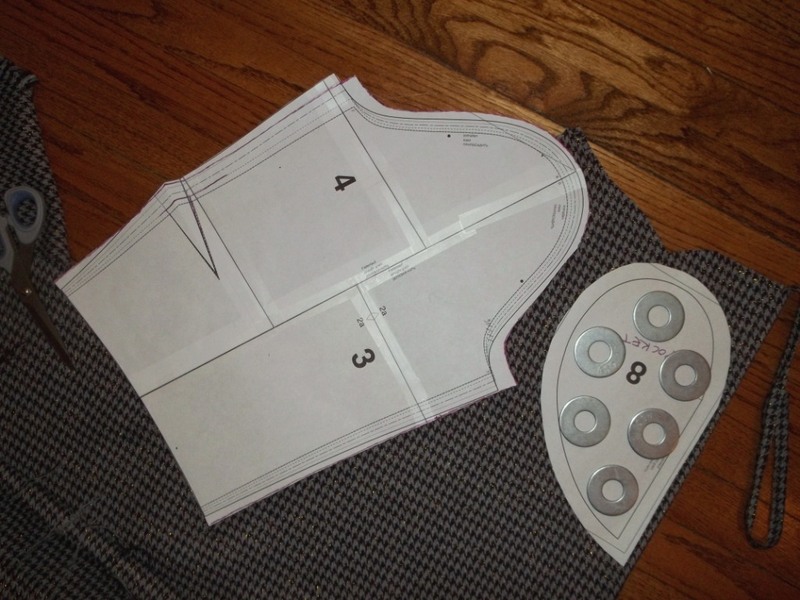 The pattern originally called for one tab at the neckline and one above the hemline. Since I planned on generally wearing the top tucked into bottoms, I switched things up and had the two tabs together at the neckline going opposite ways. There’s more interest this way. However, I suppose I sort of ruined what this pattern really is designated to be – a “Misses Overblouse” as the envelope back says. The definition of an “overblouse” is “a blouse usually fitted or belted and worn untucked at the waist.” Oh well, so much for that…the irony of the situation makes me shake my head at myself. 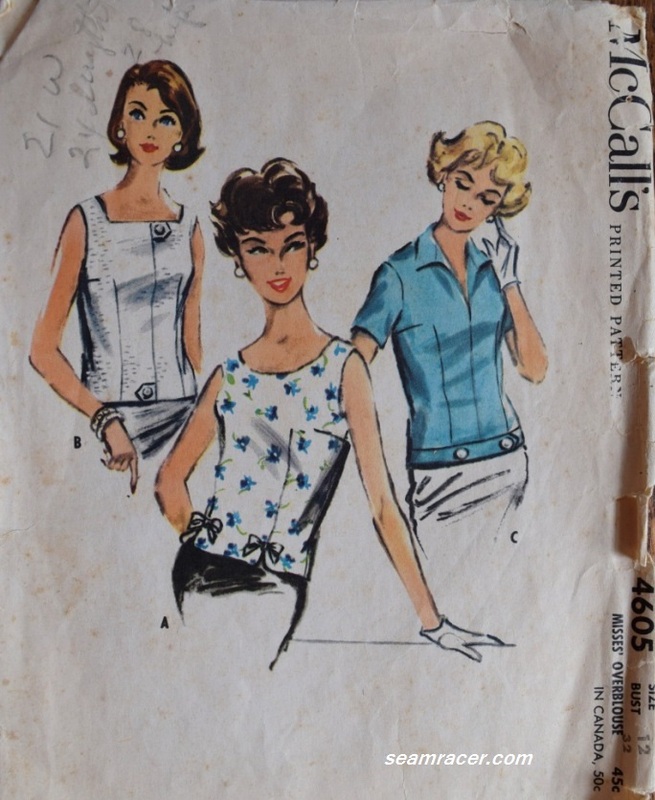 I suppose view C in blue on the far right of the pattern cover is fully an overblouse with its belted-look bottom, all buttoned down. This just goes to show your sewing is whatever you choose to do with it. Learn from it, be proud of it, and (most importantly) rock what you’ve made when you wear it! The large square neckline is of course the other main feature to this design. It’s sort of hard for me to wear something this wide and it doesn’t always stay straight or necessarily lay flat on my smaller shoulders. 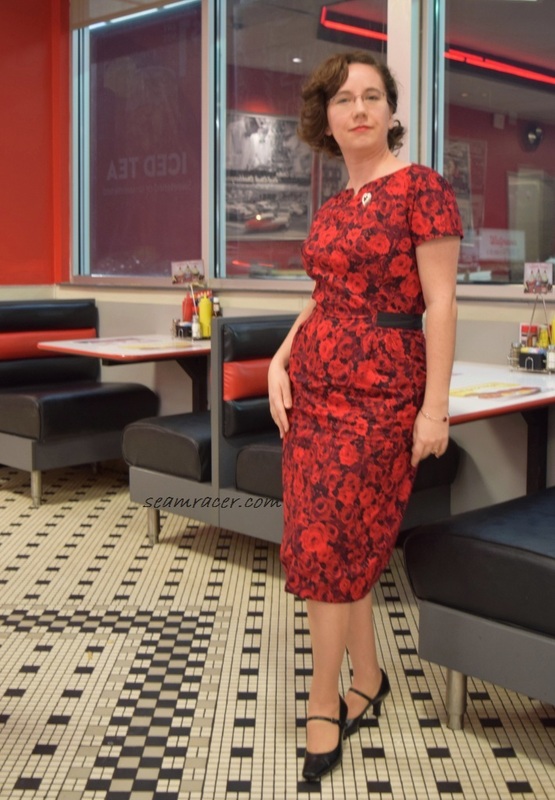 Nevertheless, it is flattering (so I feel), different, and classic of the 50’s to widen the shoulders and neckline… it also helps create a visual trick which slims down on the waist (always good). 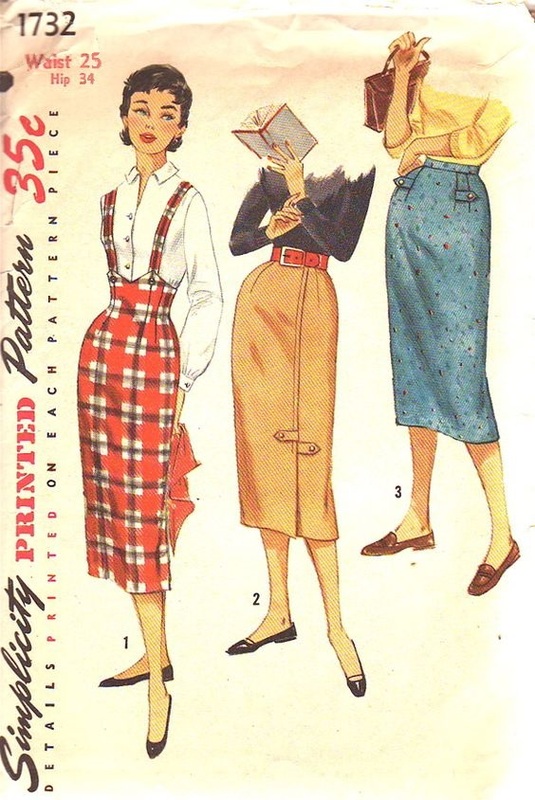 This combo of my skinny skirt and square neck top looks similar some dress designs already out there – Butterick 5032, a reprint of a 1952 pattern, as well as Simplicity 2233, a pattern from 1957 or 1958. Yet, there is something that still seems slightly 60’s about this to me, too, maybe it’s the cover hairstyles…oh yeah, well it is from ’58. I must say the top, for being such a simple pattern, was really somewhat of a problem. Getting the top fitting right was difficult. I kept taking the darts and the side seams in a little at a time again and again in between trying it on until I got tired of this. The pattern was supposed to be my size and an overblouse is supposed to be fitted but I just couldn’t get this top to really contour to me as well as I would have liked. Next time I make this (and I do want to try some of the other views soon) I will take out maybe and inch from the center front and back to bring to neckline and darts in more. Complicating the simplicity of the making of this top was the pattern itself. I’ve seen McCall’s patterns between late/mid-50’s until the mid-60’s have this “Easy Rule” feature on them and I do not like it. There is so, so much type and explanations covering the entire pattern pieces making it hard to see what is going on. If it is too hard to see the basic stuff like darts that are needed on a pattern what is the use? There are just a few special touches and tweaks to the skirt I would like to mention. I did change up the pattern just a bit when it came to the back slit. Originally the back slit was supposed to be more like a box pleat opening, but I’ve done these before and besides the boucle seemed too thick for something like this to turn out successfully so I merely made a basic, fully opening slit. I don’t mind showing a bit ‘o leg! Extra pains were taken to hand sew a blind hem to the skirt…and this from one who cannot do hand stitching. Luckily pencil skirts have short hem circumferences. I needed to make a really wide hem – it turned out ankle length before finishing…way too long! Finally, I enjoy the bright, rich green lining inside the skirt. The pop of color makes me smile every time I put my skirt on. It never ceases to amaze me at what can be made from fabric cuts leftover. At the same time one can only keep so much stuff on hand. It’s hard to find the balance of time, ideas, storage space, and places to wear one’s projects. I don’t really see any one yard patterns offered anymore…unless they’re vintage, especially between the 1930’s and 1970’s. I think one yard cuts need to be advertised and better known to help us who hold onto our leftovers (and those who have a great fabric stash) go through our store without too much effort! Even without extras on hand, buying one yard is generally a practical purchase whether the fabric is on the expensive or cheap side of the wallet. Style doesn’t have to be short because of the amount of the fabric, especially with mix and match pieces. Do you use one yard patterns, or not? Do you also sew sets that match? Cold temperatures are my nemesis. I hate being chilly and get so very easily – even layers don’t help and only are uncomfortable for me. I know, I sound picky, but I seriously think I was meant for warm weather. Yet, clothes that are a combination of tailored, vintage, fashionable, extremely cozy are nonexistent in ready-to-wear…so I make them! The best thing about sewing is the complete independence it gives. You make reality what you want and/or need. 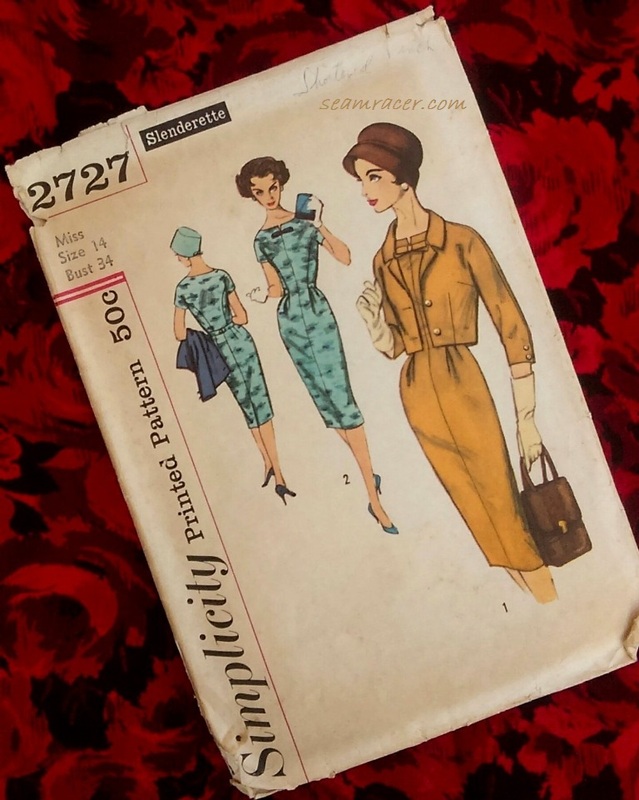 So…recently I opened my big mouth and expressed my excitement with a comment over at Burda Style.com when they recently re-released a “new” vintage 1957-1958 pattern. I don’t have anything like it and I really was struck by the simple slimming design. The comments that followed seemed to challenge me to get right to it and make my own version of the dress pattern sooner rather than later. Here’s that final garment just in time for an extreme cold snap. It was an unexpected project but perfect timing for our forecasted climate. My 1957-1958 wool dress is indeed as heavy as the weather demands, more like a coat dress than anything, yet oh-so-50’s fashionable and complimentary. I really do love it. The dress is cozy, comfy, and classy. Bonus – it has my favorite color purple with a little bit a sparkle! FABRIC: My fashion fabric is a thick wool blend (70% wool, 25% acrylic, 5% poly and other). It’s a purple and grey hound’s-tooth with some gold metallic strands woven through. The lining is a grey poly cotton blend broadcloth. NOTIONS: Everything I needed was on hand already – bias and lace tapes, thread, and zipper. TIME TO COMPLETE: Gosh, this dress took quite a while for me – maybe 30 to 40 or more hours spent over the course of two weeks. It was finished on January 20, 2016. THE INSIDES: All the inner seams are bound by either bias tape or lace tape, except for the armscye which is left raw on account of the complexity with the underarm gusset. TOTAL COST: This fabric was bought at Hancock Fabrics on a super clearance for $3.25 a yard. I bought 2 ½ yards but only used about 2 of them for the dress, so I suppose I spent about $6.50 on this dress. I’m counting the notions and lining as free because they were on hand. When I saw the pattern it immediately struck me as a coat-style dress. This is why I went with such a heavy wool. There were other ideas in my head that someone else might want to try. I was tempted at first to actually turn it into a coat, but now I’m glad I didn’t because I love it how it is. Then, I also had the idea to make the top half and the bottom half in two different colors out of a lighter weight chiffon type fabric, in brown tones, and add pockets to the chest for a kind of “safari” look. The solid color that the Burda model is wearing would look fabulous with some beautiful embroidery down the length of the vertical pleat. So many ideas and so little time. Let me know if you make any of my other ideas for a variation on this pattern! 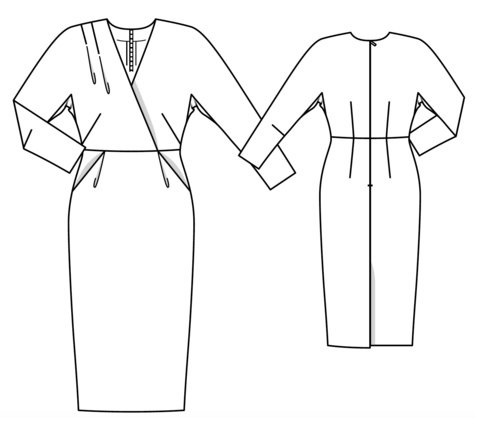 Burda patterns (for those readers who don’t know) need some assembly and tracing before being ready for layout on your chosen fabric. They can be bought as a downloadable PDF file, to print out, or traced from the leaflet included in a magazine issue (the “Retro Wool Dress” is in the January 2016 edition). A scissor with a magnetic ruler guide helps immensely to quicken along the step to getting a pattern prepped. 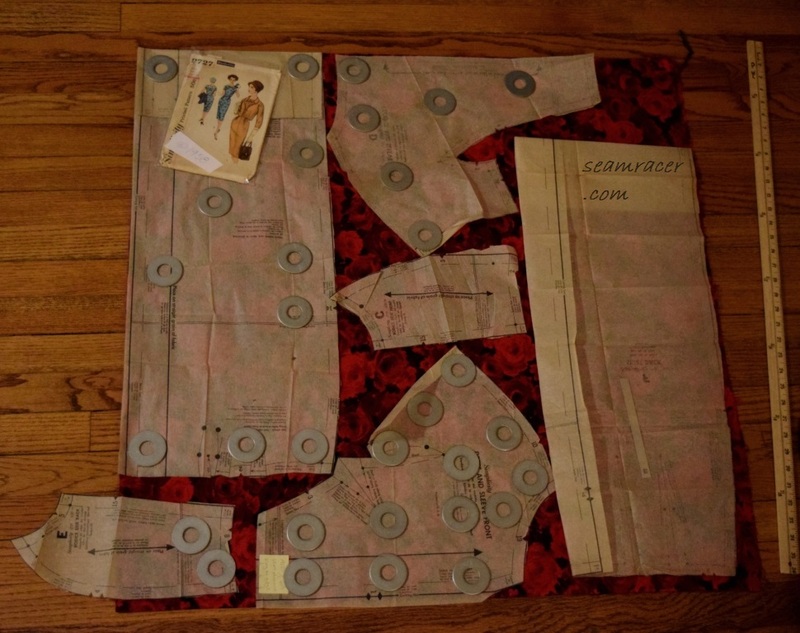 This is the stage where I pick out my size, tracing out only the size I need to use, including any grading and adding on chosen seam allowances. I don’t mind a challenging project, but during the sewing part, this dress was something I felt like I wrestled with and was confounded and frustrated by it instead. Part of my ‘frustration and wrestling’ was on account of the thick and heavy combination of the fabrics I used. However, the instructions to the pattern did not help make this dress a success at all. They are convoluted and not very clear. Since when do you sew together the side seams and the rest of the general dress and then add in the in-seam pockets?! Talk about making things hard, if not nearly impossible. The pattern piece doesn’t even seem made for this method. 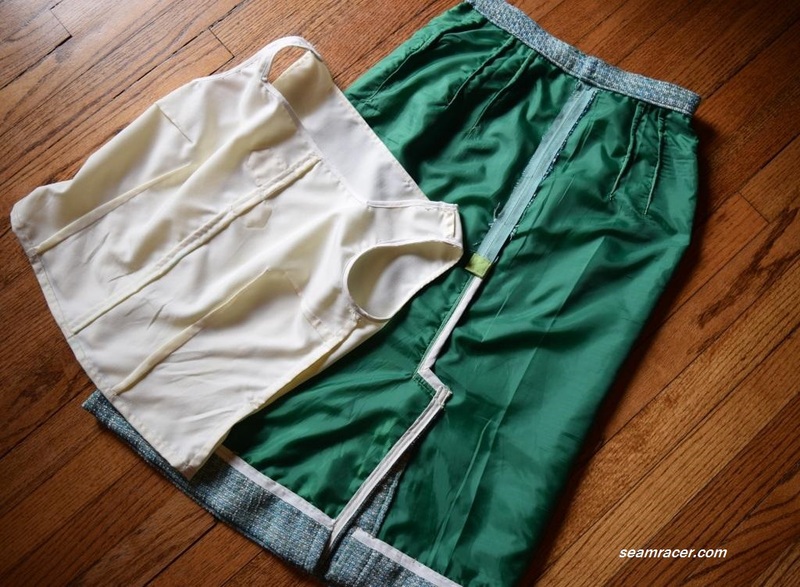 If only the paragraph for the pockets had been added in several lines earlier, it is effortless to sew in pockets as part of the side seams like all my sewing books show and as I’ve always done in my sewing. The skirt back pleated flap instructions were basically non-existent too, as it didn’t seem to recognize that the skirt is cut differently (on the fold) so it is unlike the bodice back’s pleated flap. I figured it out on my own and am happy with how it looks, I just wish I hadn’t created some smoking of my mental gears to get it how it is as you see it. As I end up saying with most all reprints of vintage patterns, I would absolutely love to see the original as a comparison. Vintage patterns almost always impress me in some way or another so I wonder if some change was made to the original before this pattern was released. Speaking of change, I made no more than a few slight changes to the design of the pattern, and all of these were on account of a better look and fit. The only exception to this might be the sleeve pattern piece, where I combined to two separate front and back into a combined one piece sleeve merely for the sake of simplicity. This pattern seems to run quite small, especially in the sleeves and the skirt bottom, and I don’t think it’s solely because of the thickness of my material. I went with my normal sizes, grading up as normal for my waist and hips, but I technically could have went up a whole size up more than that. I even cut the sleeves on the bias, but they still restricted my arms to the point that I couldn’t reach up to my hair. When I would reach back to put my hands in my pocket I would smash my bust due to lack of room too. I have a feeling that there is too sharp of a curve to the bottom of the sleeve. If this was a ready-to wear item, and fit this restrictively, I would not buy it. So time consuming work and all, I unpicked liberally to get the fit right (as you can read more about later down). For every two steps I made in progress, it truly felt like I made two steps back in unpicking. 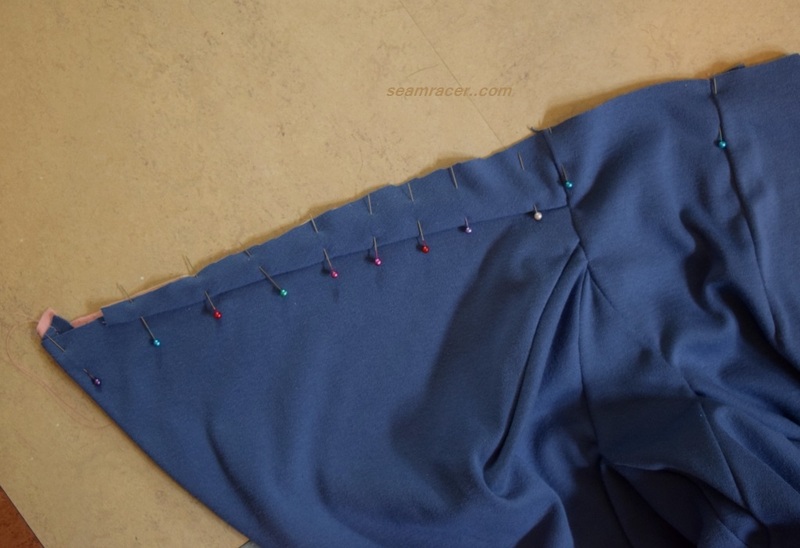 For most of the evenings spent sewing I would get one spot right only to have to unpick another spot which needed re-sewing and fixing, but after so many nights of this balancing act I eventually worked out all the ill-fitting spots. To me, the garments I make should fit right or the time spent in sewing is worth no more than time roaming a mall for clothes to my liking. A pattern needs to turn out well, too, so others can enjoy it, thus I’m giving an open confession of the problems I ran across. So many extra little touches were made, that for my benefit (and maybe yours), I’ll quickly list them. 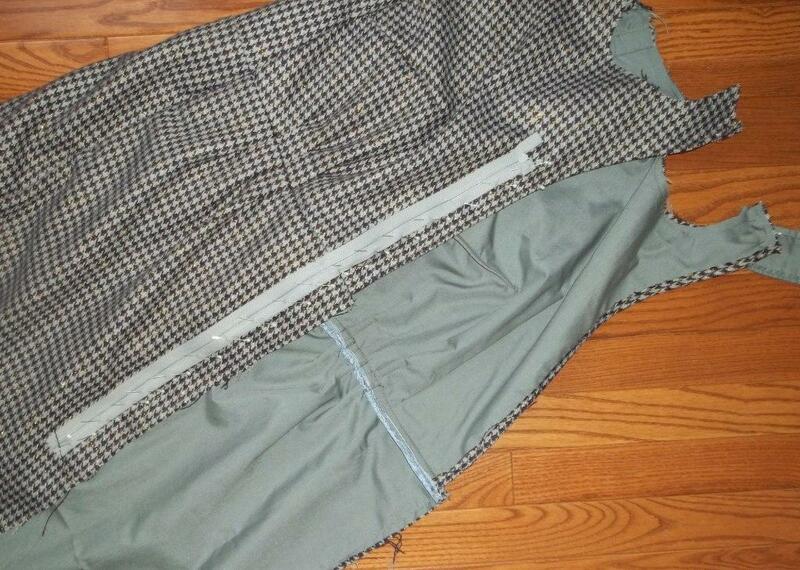 Firstly the pockets were sewn into the skirt pieces before doing the side seams for real “in-seam” pockets. I remembered to do the hem (a wide 1 inch hem) before doing the skirts’ pleats and side seams to make things easy and less bulky. The same early pre-hemming was done to the sleeve hems. In order to fit my derrière, I took out the back skirt darts, cutting their length in half. 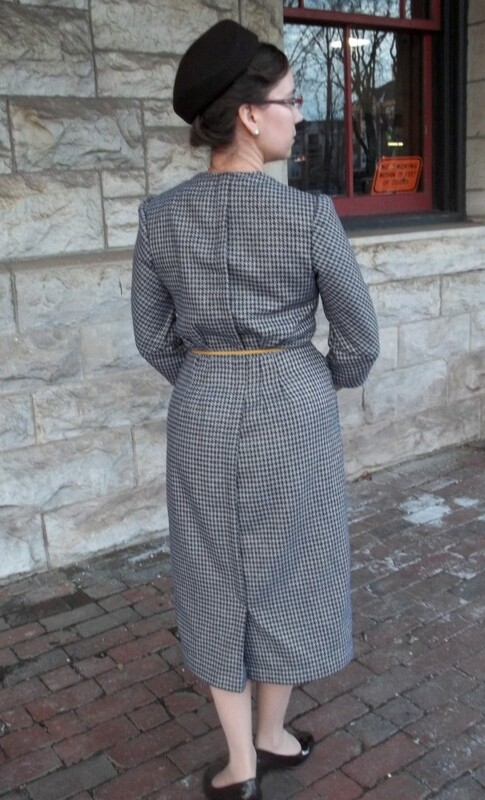 The vertical back pleat was let out for a smaller fold to give my rump and legs slightly more room. I picked out the 5/8 inch seam allowance of the bottom half of the sleeves to a scant 3/8 inch. The self-facing edges for the front were turned under for a clean edge (not mentioned in the instructions but a very good idea I think). A tiny hook and eye is sewn at the top outer edge of the zipper end to hide it under the pleat (works great). Shoulder pads are tacked in as well to nicely fill in and shape the bodice. Finally, to appease my preference, I tacked down the top corners of the front top opening so that it seems as if there are lapels at the neck. 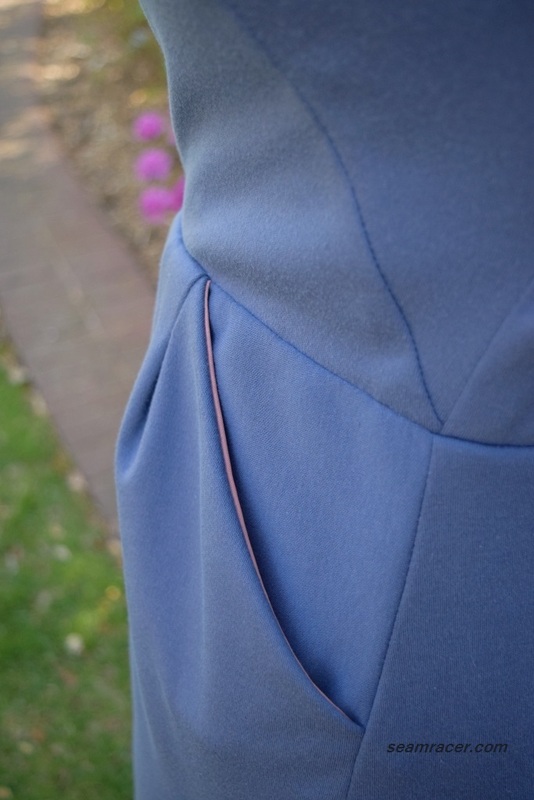 Under the most of the center front pleated lapel is the zipper. It has an interesting lapped sort of insertion which reminds me of a pants zipper fly. It was confusing at first especially sewing it wrong side down (see picture), but it works. When my mom saw the dress on me, she was voicing, “How do you put it on? Oh, there’s a zipper under the flap!” Surprise. The very best alteration to the fit and look of the “Retro Wool Dress” is my addition of underarm gussets. I don’t mean to pat myself on the back, but the gussets make it more 50’s than it already is and fix my fitting problems. Underarm gussets were a frequent sight on 1950’s era garments. They are also the perfect solution for problems with sleeves which offer limited movement without having to start from scratch again. I drafted my own gusset this time – a pointy oval “cat eye” shape with a 2 inch center width by 4 inch center length, without seam allowances. Two and ¼ inches down the side seams was unpicked open in the bodice and in the sleeve so could insert the one piece gusset. See Gertie’s blog for a great tutorial. Adding the gussets wasn’t really all that hard for me to sew, just awkward and fiddly, but I made it work…and boy does it improve things! Room glorious room! Pockets flaps are vying for first place with the underarm gussets when it comes to helping the look and fit. As they were, the side pocket openings were slightly puffing out, changing the silhouette, as well as being a little too obvious for my taste. So I made them more “fashionably” obvious by closing them with a self-drafted flap closure. 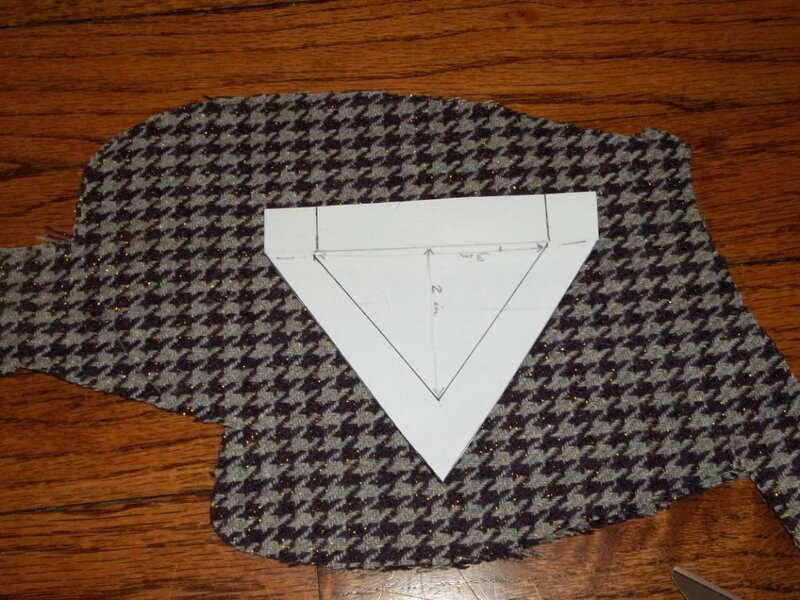 I drafted a 3 inch by 2 inch triangle (before seam allowances) to be sewn on the skirt back pocket edge and closing with a decorative button with a snap closing underneath. I love the little bit of extra class the pocket flaps add. They so clearly remind me of those little fine details that I see with designs (especially on suits) from the 1940’s and 1950’s when class and style and attention to subtlety was a matter of course. Both the gussets and pocket flaps (I think) show how a little extra effort goes a long way. 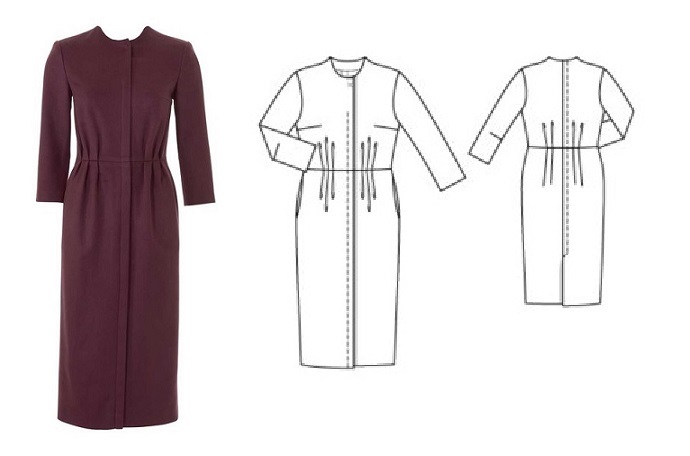 Burda’s “Retro Wool Dress” has a timeless appeal which is modern yet entirely vintage. It has the hourglass silhouette with the slightly exaggerated blousy hips of a classic 1950’s dress. 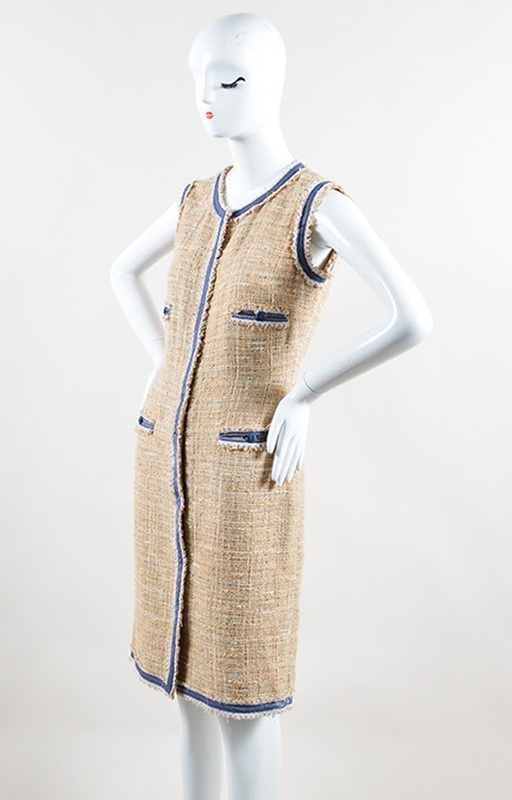 Yet, its features also remind me of other garments I have seen, such as a spring 2009 Chanel cotton suiting dress which has a simi lar zip front under a vertical placket. Burda’s “Retro Wool Dress” also makes me think of another vintage pattern from another decade, Butterick’s new re-release #6282 and (what I think) is its original, Butterick #1192 from my collection, both from the year 1941. These two also have a vertical placket down the front, with a pleat hiding underneath and closures down part of it, and the small flap collar lapels (on the old Butterick #1192) like what I did to my version of Burda’s dress. 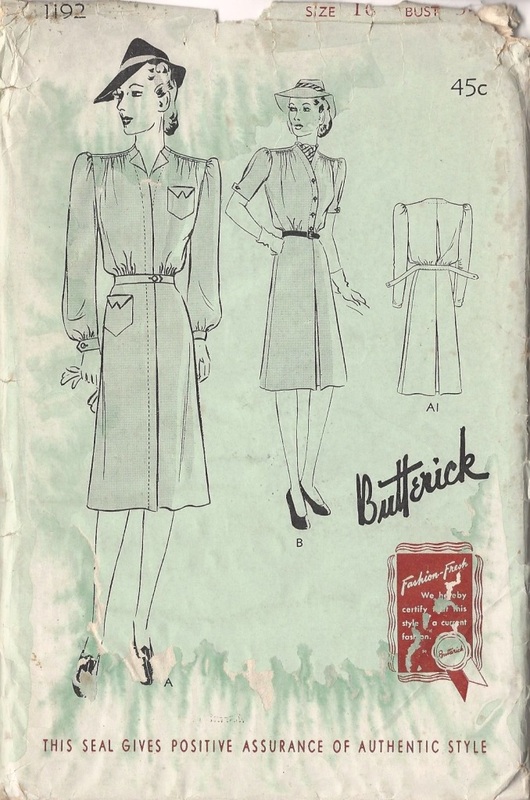 Thanks Burda Style for another interesting re-release of a vintage pattern. It is a good dress for me and a wonderful addition to my wardrobe, as well as an enjoyable make. Another step forward in my effort towards combating the cold!